Though it's just over an hour from Vancouver by air, Nimmo Bay is about as far away from it all as you can get. Nestled at the foot of Mount Stevens on the glorious British Columbia coast, this luxurious adventure lodge is surrounded by nothing but nature—miles of pristine rainforest, crystalline waters and craggy peaks, yours to enjoy by boat, kayak or helicopter. Imagine soaring over deep blue glaciers as your favorite music plays, then following a ribbon of river as it cuts through the forest. Your helicopter dips low enough for you to spot bears and moose, before stopping for some phenomenal trout and salmon fishing. Another day, you might land on a secluded white sand beach for a picnic and a swim, before being whisked away to kayak on a peaceful fjord, follow killer whales on a private boat, or hike through a remote alpine meadow, at eye level with mountain goats. After your day of adventure, return to the lodge for a well-earned massage, gourmet meal, and peaceful night’s sleep in your intertidal chalet. 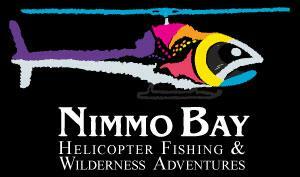 Nimmo Bay was the first resort to offer Helicopter Fishing and is the innovator and leader in this field. 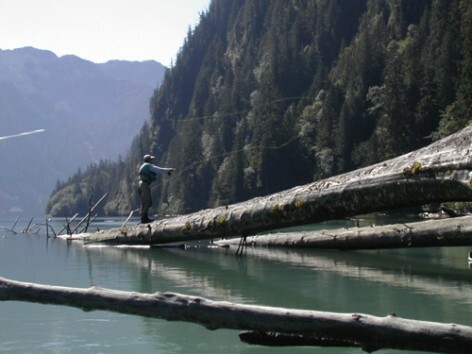 In addition to their signature helicopter adventures, Nimmo Bay offers a huge variety of other ways to enjoy the local wilderness: fishing trips, glacier cruises, wildlife safaris, surf biking, paddle boarding, paintball, explorations of Native American culture, and wellness retreats, to name just a few. The Murray family has been offering world-class hospitality at Nimmo Bay for 31 years. Their basic principle can be summed up by the equation E2=MC (Expectations Exceeded = Memories Created). This statement originated in 1999 on a family trip to Newfoundland, where they would enjoy the millennium’s first sunrise at the easternmost point of North America. On the plane was a Time magazine with the man of the century, Albert Einstein, on the cover, along with his Theory of Relativity. The family patriarch, Craig Murray, decided that the world needed another theory—the Theory of Hospitality. After some brainstorming, their philosophy was born. Hospitality is a way of life at Nimmo Bay—and so is family. Craig and Deborah know what types of activities will entertain and fascinate kids, because their own children grew up doing them. Those kids, now adults, are essential members of the Nimmo Bay team, and together with their parents, they make this coastal retreat the ideal place for families and friends to learn the ways of the wilderness, free themselves from urban cares, and create everlasting memories.